With a stay at Home Inn in Shanghai (Minhang), you'll be within a 15-minute drive of Shanghai Botanical Garden and Shanghai Oriental Sports Center. Featured amenities include luggage storage and an elevator (lift). Free self parking is available onsite. When you stay at Financial Hotel in Yantai, you'll be 8 minutes by car from No. 1 Bathing Beach. A shuttle from the airport to the hotel is provided at no charge. When you stay at Sanya City Link Hotel in Jiyang, you'll be by the sea, within a 10-minute walk of Dadong Sea and Dadonghai Beach. Free self parking is available onsite. 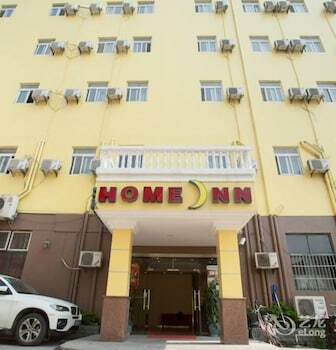 With a stay at Dingshang Xiangyu Apartment Hotel Changsha Railway Station in Changsha (Fu Rong), you'll be 3.4 mi (5.4 km) from Martyrs' Park and 3.6 mi (5.8 km) from Helong Stadium. When you stay at Zaozhuang Jindu Grand Hotel in Zaozhuang, you'll be 12 minutes by car from Zaozhuang Museum. Free self parking is available onsite.